For many real-life tasks such as driving or operating a robot, the spatial dimension is very important. 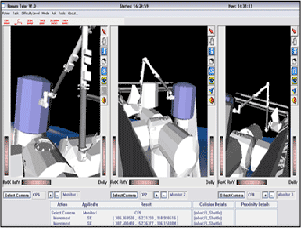 For learning such tasks, relying on a simulated virtual environment can be beneficial, as it can allows reproducing complex scenarios at a low cost. However current virtual learning environment cannot generate scenarios that are tailored to each learner spatial representations and skills, to help learners develop their spatial reasonning capabilities. Therefore, the goal of this project is to develop (1) a new cognitive model for evaluating spatial skills and representations of learners performing tasks with a simulator-based tutoring system, and (2) to propose mechanisms for using this insight to automatically generate personalized scenarios and feedback that will help learners to improve their spatial representations and reasoning skills. To achieve our goal, we have extended a cognitive model that we have developped in previous work (see project 3), based on the latest researches on spatial cognition. The extended model [1, 2, 3] was applied in the RomanTutor/CanadarmTutor tutoring system (cf. fig. 1) to automatically evaluate spatial representations and skills and provide custom assistance to learners that learn to operate the Canadarm2 robotic arm. Fournier-Viger, P., Nkambou, R. & Mayers, A. (2008), Evaluating Spatial Knowledge through Problem-Solving in Virtual Learning Environments. Proceedings of the Third European Conference on Technology Enhanced Learning (EC-TEL 2008). LNCS 5192, Springer, pp 15-26. Fournier-Viger, P., Nkambou, R., Mayers, A. and Dubois, D. (2007), Automatic Evaluation of Spatial Representations for Complex Robotic Arms Manipulations. Proceedings of the 7th IEEE International Conference on Advanced Learning Technologies (ICALT 2007), pp: 279-281.